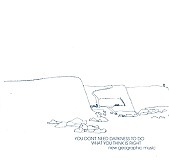 Domino Records' You Don't Need Darkness To Do What You Think Is Right - New Geographic Music is a graceful collection of various shades of pop. From the spacey pop of The Pastels' "Intro" which fades into track two "Everybody Is A Star", a melodically soothing piece, to the Japanese pop of Nagisa Ni Te's "Me, On The Beach". Pedro, Sister Vanilla, Empress, and National Park all deliver (along with all sixteen bands) beautifully crafted pop songs. The two stand out tracks for me are Kevin Shields' "Outro", an airy instrumental, and Future Pilot AKA's jazzy/hip-hop pop on "Remember Fun (Like We Was Young)". A grand collection of memorable pop songs; I'll give it an A.